Regular Intheboatshed.net correspondent Chris Brady has written in to point out that a BBC programme charting the history of carol singing included the story of popular Christmas song ‘I Saw Three Ships’. Thanks for the tip Chris! I didn’t know that a version of the song was collected from boatmen on the Humber in 1895, and sent to the scholar Reverend Sabine Baring-Gould, who was a noted folklorist, as well as an antiquarian, a writer of hymns, and a prolific author on any number if topics. 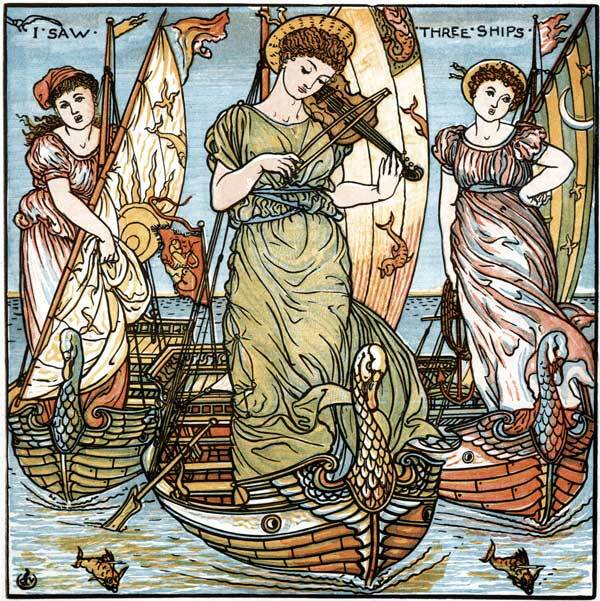 Baring-Gould’s notes of the Humber boatman’s version can be seen at the Vaughan Williams Memorial Library website – it mentions that the ships are carrying the skulls of the three wise men who visited the baby Jesus shortly after his birth. Author Gavin AtkinPosted on December 24, 2009 July 7, 2015 Categories Boating, boats, ships and the sea, Culture: songs, stories, photography and art, Sailing shipsTags baby's opera, bleak midwinter, carol, Gavin Atkin, happy christmas, i saw three ships, julie atkin, melodeon, merry christmas, three ships, walter crane1 Comment on Merry Christmas and happy holidays to all our readers and contributors!